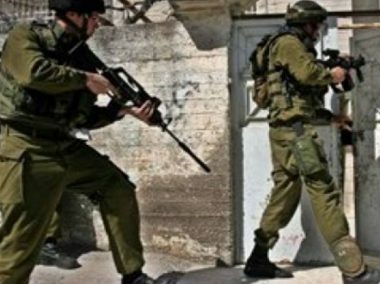 The Hebron office of the Palestinian Prisoners Society (PPS) has reported that Israeli soldiers abducted, on Thursday at dawn, seven Palestinians, during massive invasions and violent searches of homes, in different parts of the southern West Bank district of Hebron. One Palestinian was also abducted in Tubas. It stated that dozens of soldiers invaded the home on Sa’ad Qaisiyya, 25, who was killed by Israeli fire, Wednesday, after allegedly carrying out a stabbing attack in Teneh Omarim illegal colony, built on private Palestinian lands, south of Hebron, mildly wounding a colonialist settler, who managed to shoot and kill him. During the invasion into the Qaisiyya home, the soldiers abducted his cousin, identified as Amjad Khalil Qaisiyya. In Beit Awwa town, the soldiers searched several homes and abducted Omar Masalma, Farouq Hussein Masalma, Aref Sweity and Atef Hussein Shallash. In addition, the soldiers invaded several neighborhoods in Hebron city, searched homes and abducted Anas Mahmoud Zghayyar and Mansour Samir al-Qudsi. Owners of two of the invaded homes have been identified as Abdul-Karim Abu Shkheidem and Majed Azmi Abu Hammad. Also at dawn, the soldiers invaded Hizma town, northeast of occupied East Jerusalem, searched homes and abducted a young Palestinian man. Israeli soldiers invaded, on Thursday at dawn, Hebron city, and the nearby Beit ‘Awwa and Doura towns, in the southern part of the occupied West Bank, and abducted six Palestinians, during extensive and violent searches of homes. One Palestinian was also abducted in Tubas. The soldiers invaded Beit Awwa town, west of Hebron city, before breaking into several homes and violently searching them, and abducted three Palestinians, identified as Omar al-Masalma, Ghazi Farouq and Ali ‘Aref Sweity. The Israeli army said it invaded Beit Awwa after a Molotov cocktail was hurled at a military roadblock, near the town. The soldiers also invaded homes in Hebron city, and abducted two young men, identified as Anas Zghayyar and Mansour al-Qudsi. Furthermore, the soldiers invaded Doura town, searched homes and abducted a young man, identified as Atef Shallash. In related news, the soldiers invaded the al-Far’a refugee camp, south of the central West Bank city of Tubas, searched homes and abducted a young man, identified as Firas Salah Sawalma.